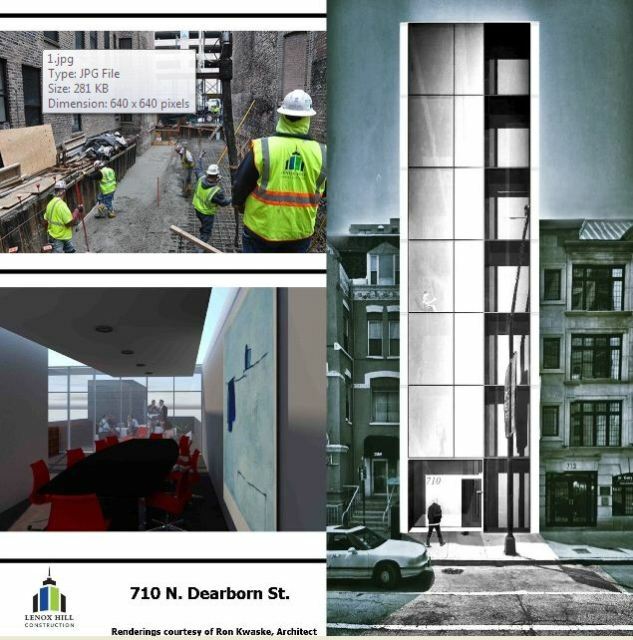 Lenox Hill Construction, a premiere Chicagoland construction company, has broken ground on an all-new, six story medical office building at 710 N. Dearborn St. in the River North neighborhood of Chicago. Lenox Hill Construction works to develop a new medical office building at 710 N. Dearborn St. in the River North neighborhood of Chicago. Renderings courtesy of Ron Kwaske, Architect. The office will act as an expansion for the Illinois Orthopedic Network and Wiesman Cosmetic Surgery & Wellness Institute. "We're growing leaps and bounds," said Dr. Irvin Wiesman. "With the expansion of our network we needed more space both clinically and for administration." The building's main use will be for administrative functions, however some of the floors will be dedicated clinical space. "We wanted to do something not just run of the mill, commercial block and brick," said Dr. Marc Strongin. "We are an orthopedic practice, but we consider ourselves boutique. We really treat our patients like family and we want them to feel as comfortable as possible when they visit us." Designed by architect Ron Kwaske, the new building will feature a modernistic style and boast an all glass and aluminum facade. "The building itself is extremely challenging because it's for medical use and is only 20 feet wide," said Kwaske. "We had to get elevators, offices and treatment rooms to fit while still giving the building a feeling of space. We work with inches, not feet, and from immediately talking to the Lenox Hill team, there was no doubt in my mind that they understood how to put this building together." "I was happy to receive the call from Ron that we had been selected to work on this project," said Henry Hill, CEO of Lenox Hill Construction. "There was a natural synergy between us, and I think it will show in the finished product. If all goes as scheduled, we should be done in the next six months." Lenox Hill Construction provides general contractor services, offering building project management from start to finish. The firm can also be engaged as a construction project management company, coordinating a project's processes with vendors, material providers and other workers. Lenox Hill provides complete design/build services, preconstruction development services and facility maintenance, and every project's scope and price point can be customized to each client's specific needs.